This wilderness property occupies 1,060 acres along the high western rim of Hastings Mesa sixteen miles from the town of Telluride. The mesa, at an average elevation of 9,000 feet, is surrounded by views of nearby peaks of the San Juan Mountains and the canyon of the San Miguel River. The landscape of meadows, spring fed ponds, aspen groves and ponderosa pines supports abundant wildlife—deer, elk, grouse and hawks. • Visual and acoustic seclusion from other homesites and from the road. • Minimal site disturbance of ground cover and wildlife habitat. • Micro-climatic suitability for solar access, wind protection and shading. 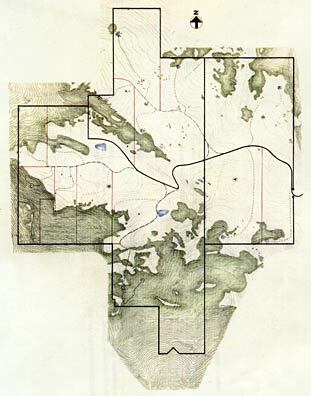 ground contours, tree lines, water courses and rock formations are used to establish the property lines.